Chiropractic treatment is a primary healthcare profession that specialises in the diagnosis, treatment and prevention of mechanical disorders of the musculoskeletal system and the effects of these disorders on the function of the nervous system and general health. Deriving from Greek, chiropractic treatment is a gentle, non-invasive technique performed with the hands to restore function of the joints and muscles, remove nerve irritation and restore spinal balance, returning the body to healthy healing. It is an alternative treatment to drugs and surgery. Musculoskeletal problems can be caused by accidents, stress, lack of exercise, poor posture, illness and wear and tear. Patients are referred for x-ray or MRI scanning when clinically necessary. Our chiropractors also provide advice on posture, stretching, strengthening and core stability exercise to aid rehabilitation in addition to nutrition and other aspects of lifestyle. The emphasis is on prevention and maintaining optimum health. Chiropractic treatment is suitable for every age of patient including infants and children, the elderly and for pregnancy. 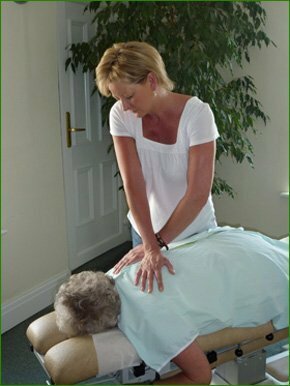 A patient receiving treatment at Leckhampton Chiropractic Clinic.